This traditional herbal medicinal product used for the relief of excessive sweating associated with menopausal hot flushes, including night sweats exclusively based upon long-standing use as a traditional remedy. 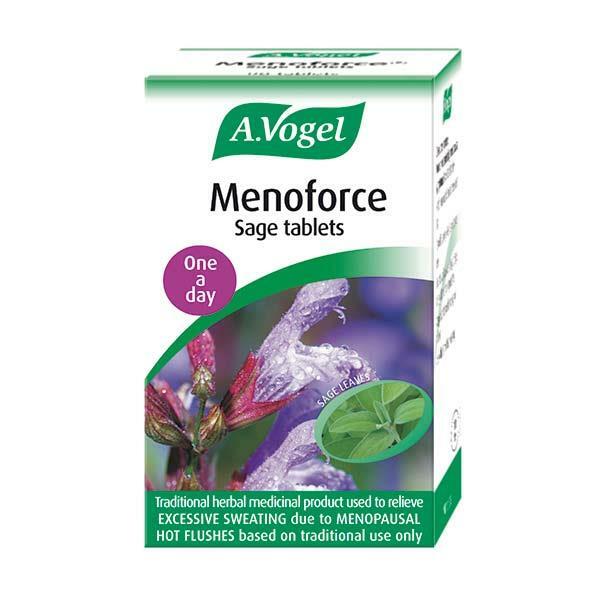 Menoforce® Sage tablets contain an extract of sage herb obtained from freshly harvested, organically cultivated sage. Sage has been traditionally used as a herb for the relief of excessive sweating, particularly during the menopause. Menoforce® comes in the form of a one-a-day herbal sage tablet. Each tablet contains 51mg of concentrated dried tincture from fresh Sage (Salvia officinalis L. ) leaves (1:17-18). Extraction solvent: ethanol 68% V/V. This is equivalent to 3400mg of tincture of fresh sage herb (leaves). Women experiencing menopausal symptoms, take 1 tablet each day. Extracts of sage herb, such as Menoforce Sage tablets, have become one of the most popular menopause treatments, gaining a reputation as a simple way of helping deal with excessive sweating, hot flushes and night sweats during the menopause.